This is Colchicum ‘Water Lily’ and it is one of the last things to bloom for the season here on Glen Road. It’s hard to imagine Fall without the appearance of our Colchicums. Their bright blooms rise without warning and shine in the sharp light of Autumn. 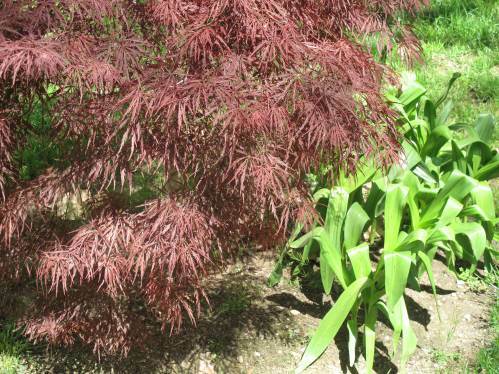 We planted our bulbs at the base of our Japanese maple trees several years ago. 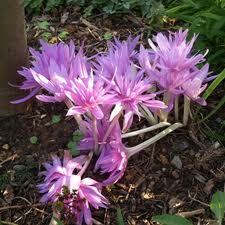 Colchicum ‘Water Lily’ produces several double, lilac-pink flowers. Their silky texture is a great contrast to the ruddy complexion of Fall. 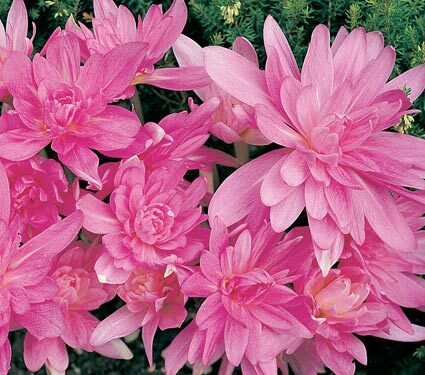 Sometimes called the Autumn Crocus, the Colchicum is a one-of-a-kind wonder in the flower kingdom. They grow from corms, which are available in late summer, and the astonishing thing about them is that they will flower without being planted at all. Just setting them on a sunny window sill is enough. They can, however, be arranged in a shallow dish of gravel, pebbles, etc. The best thing to do is plant them like we did outside in shallow soil in a sunny area where they will not be disturbed so that you can easily enjoy them on a yearly basis with minimal, if any, work involved. Colchicums come in various tones of pink and lavender and never fail to surprise with their delicate appearance amid the rougher weather of Fall. It all starts in Spring, when a clump of broad, deer-proof leaves emerge, stay for a while and then vanish by midsummer. Then in Fall, these dainty flowers emerge to show off their brilliant color. Here is an older shot of their Spring appearance. See their leaves on the right? So we are officially near the end of the 2011 garden season with the blooming of our Colchicums. It is a good feeling mixed with some sadness. Like the plants, all gardeners need to re-energize during the Winter, but we will miss all of the pretty blooms that we have seen over the Spring and Summer. What final blooms do you see in your garden that signal the end of the growing season? This entry was posted in The Garden-2011 and tagged Acorns, Beauty, Blog, Entertainment, Fall, Fun, Gardening, Life, Lifestyle, Love, My Life, Nature, Photos, Thoughts. Bookmark the permalink. Those look great. I just pulled the last of the pepper and okra plants.